Shared Vision: Great collaborations are rooted in a shared vision of how to advance the mission of the university. The vision needs to further the strategic objectives of each partner, but individual interest alone cannot animate truly transformative collaboration. Trust: Without trust there is no collaboration. Trust is built when partners believe in one another and demonstrate through their actions a commitment to ensuring the success of the other partner. When this extends beyond the specific instance, a culture of collaboration begins to take shape. Generosity: Mistakes will be made; old habits of self-interest die hard. Over-sensitivity and pettiness erode the spirit of cooperation. When mistakes happen and old habits undermine efforts, generous and patient responses advance shared interests and further cultivate trust. Accountability: There is no trust, of course, without accountability. Partners need to be able to say hard truths to one another, hear them without becoming defensive, and respond with patience and understanding. Good Humor: Laughter makes things easier. Let’s not take ourselves too seriously. Effective collaboration opens a space for playfulness, for inside jokes that arise when shared obstacles are circumvented, and for the fun that comes with shared success. 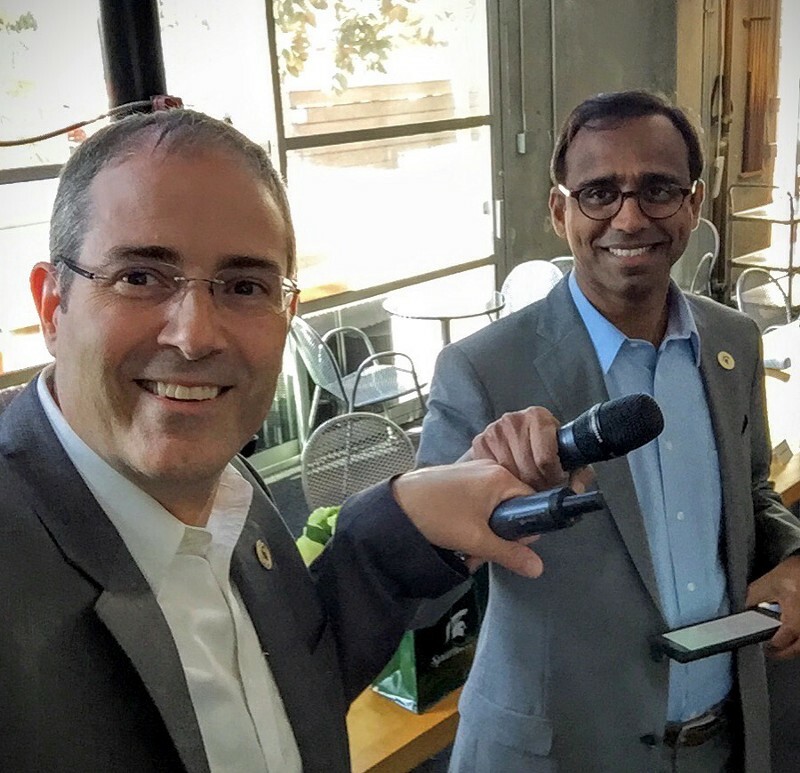 Deans Christopher Long and Prabu David at an MSU Media Arts Collaborative presentation in LA.